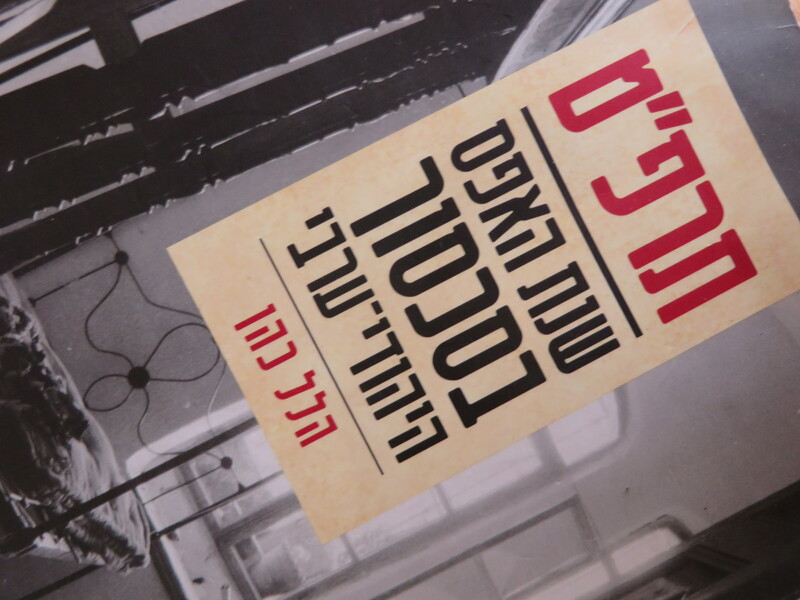 In this look at 1929 anti-Jewish riots in British Mandate Palestine, Hillel Cohen’s 1929 (Hebrew) throws much needed light on contemporary debates regarding the Israel-Palestine conflict. Rather than focus our attention on 1948, the creation of the State of Israel, and the creation of the Palestinian refugee crisis or Nakba, Cohen dials the story back to 1929 and the bloody Arab riots in Jaffa, Jerusalem, Sefad, and most infamously Hebron. It was in Hebron that a centuries old Jewish community pre-dating the Zionist movement was violently uprooted. Cohen’s book does a number of things. Without taking sides, Cohen explores the sense of grievance, the fear of losing their country that drove the Arabs of Palestine to attack Jewish communities regardless of the formal orientation of those communities vis-à-vis the Zionist movement. And he gives a sense of the grievance and rage on the part of many Jewish Palestinians who experienced the riots as young people and who were then involved in later military actions during the 1948 War of Independence. The analysis in Cohen’s book does a lot to complicate if not refute at least two arguments made in contemporary debates by critics of Zionism. The anti-Zionist argument seeks  to make a sharp distinction between Jewishness-Judaism versus Zionism by asserting that not all Jews, especially ultra-orthodox and Sephardim, even in Palestine, were non-Zionist, or even anti-Zionist, and  to assert that Arab-Jewish relations were on the whole amicable and equitable before the Zionist incursion into Palestine as a political project based on sovereignty. One conceptual distinction raised by Cohen is the one between “politics” and “culture.” Prior to the Zionist movement, the cultural-religious ties binding Jews to the Land of Israel were not “political,” and were not seen as such by the local Arab people. He also notes that the deep ties that bound traditional Sephardic Jews with their Arab-Muslim neighbors were “cultural.” Regarding Sephardic Jews in Palestine, Cohen maintains that in the wake of the events of 1929, this Sephardic cultural-Arab Jewish identity gave way to and was trumped by national-religious Jewish identity that was political in nature (p.99). Another conceptual distinction raised by Cohen is the one between “security” and “politics.” He cites Benny Morris who quotes this appraisal of Arab-Palestinian resistance to Zionism by David Ben-Gurion. In regard to the narrow issue of security, it was indeed, the Arabs who went on the offensive to attack their Jewish neighbors, and to kill people with whom they had, in fact, lived in peace for many years. In this respect, it was the Jews who were attacked and who defended themselves. But “politically,” Ben-Gurion noted, the Zionists were the aggressors against whom the Arabs of Palestine were on the defensive, driven to defend their homes and their country (p.389). Cohen’s analysis does not lend itself to any easy notions regarding the rights and wrongs of the conflict, including moral rights and wrongs. But his conclusion strikes me as weak. Pointing to Arabs who saved Jews and Jews who supported reconciliation with Arabs, Cohen asserts that it could have been otherwise, that there were other possibilities, other choices that could have been made to avert conflict (p.395). But this is no longer a political or political claim as much as a moral one. Reading Cohen’s own 1929 one gets the sense that the clash between two very different political communities was inevitable given the practical realities that drove the members of each community apart from and against each other, that drove them to assert or maintain their own political dominance in the country, creating new cultural alignments and realignments in the process. What Cohen’s analysis does lend itself to is a much broader view of the conflict, an expanded point of view with which to locate and to limit the conflict in a very specific historical time (pp.13,14). For Cohen and perhaps for us, this expanded point of view provides many years after the facts for a non-national conception of 1929 and 1948. These new perspectives and new political conceptions are based on human values and human dignity (p.396). What I take from the book is the utter futility in trying to advance one-sided moralizing conceptions with which to understand the conflict. There’s no way to sort out a clean, ethical balance sheet judging one political party to the conflict innocent, and the other guilty. To look back to an important origin point of the conflict allows one to see that the historical record is too mixed up to allow that kind of neat moral calculus. It’s true. It’s impossible. But it did shut him up. Maybe he was pondering. Of course “ending the conflict” as a benchmark can be safey ignored as self-proving: if the conflict ends then it has ended. But more interestingly: to what degree is the occupation a factor? Or conversely, things “deeply seated in Jewish or Arab culture or religious beliefs”. My sense is that if the occupation ended, the Palestinians would be happy and then remember that they had a JEWISH state next door and pick up the game from where they had been over the past 1400 years. My guess is that the problem is as much 1948 as it is 1967. From Cohen one learns that the problem is as much 1929 as it is 1948. That said, resolving 1967 in a decent way would do a lot to tamp down enmity, if not between Israelis and Palestinians than at least between Israelis and Arabs, a lot of whom, it seems to me, would like to move on. I say this only on the basis of anecdotal evidence and what I read in the English language Arab press. And I really don’t get that same sense that you do in English language Arab press. It always has that nasty snark to it. It’s not Hezbollah but it is not amiable. Even someone as rational as Rami Kouri. I would highly recommend Marc Cohen’s Under Crescent and Cross which does a good job getting at a general sense as to the position and place of the Jews in classical Islamic-Arabic hierarchy, and relative to the complete outsider position of the Jews under Christendom. He hews a judicious middle line between those who claim that the Jewish position under Islam was golden versus those who claim that it was hell on earth. Thx I will take look.